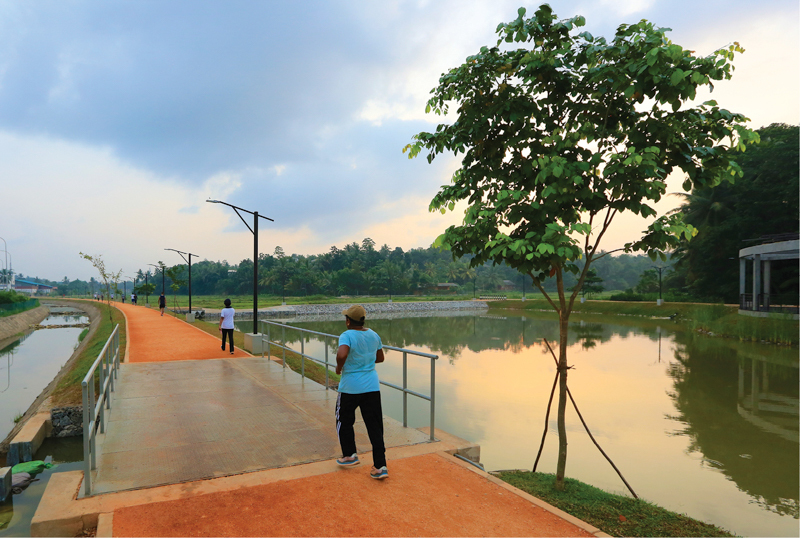 Kadawatha, a bustling town, just 16 kilometres away from Colombo, is a town packed with small business establishments. The Aldeniya Suwatha Park (Aldeniya Health Park) is the ideal place for the fitness and health conscious to walk their way to well being. It was apparent that those who were using the park had not come for the casual stroll on a Sunday morning. Scores, from nearly all age groups, most of them attired in track suits and sneakers, were all on the move; and it was clear, by the concentrated countenance on their faces and the brisk gait in their movements, that what was trending here was serious stuff. These joggers meant business. And their business was to use this facility provided free to the full and improve their physical faculties to the maximum. The track is exactly 1200m long. Though not tiled, the gravel pathway is evenly laid and levelled and easy to walk on. Onto your left hand side, down below runs an old canal. Further left and on higher ground is the busy highway. Trees have been planted at intervals on the right side of the track and in a few years time, no doubt, they will provide the shade that will give users a more enjoyable walk. On the right, at the beginning of the gravel carpeted track, is the children's playground. The centerpiece, under a large white canopy, is a replica of a medieval castle with passages. Children can explore and slide down to its exit - a far cry from the old simple ladder and slide. Passing the kids arena, is a reasonably sized manmade lake. Its presence not only gives the whole walk way an aesthetic beauty but its waters serve to rob the air of excessive heat and to produce a cooling atmosphere. It is a welcome touch of landscaping which lifts this part to a higher level. The beauty of Aldeniya Suwatha Uyana is that all the components complement each other to create a great atmosphere. After passing the lake, paddy fields flank the track and the colour of verdant green swerves to add a refreshing vista to the eye for the rest of the way. Early birds, come in search of worms, can be seen grazing the fields and their sight is a pleasant diversion for users as they walk steadily on. 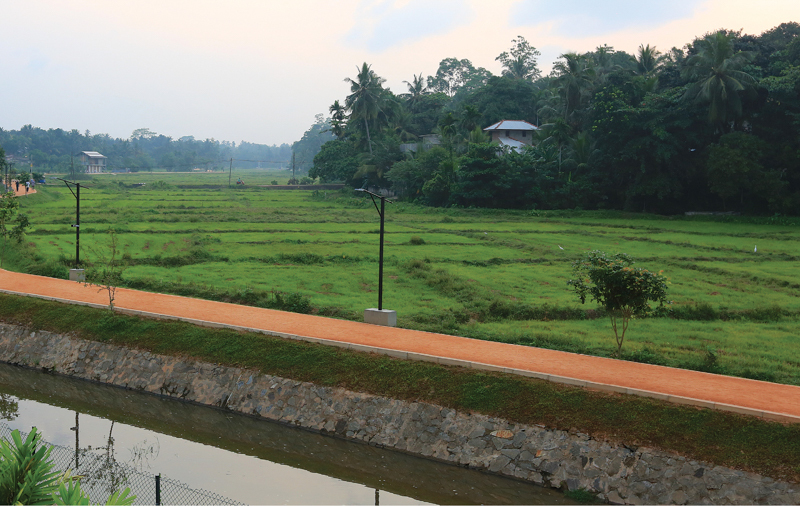 The paddy fields line the track as the track progresses towards its end - to an exit that falls onto a new path. Many use the track to exercise and stretch their muscles through walking for general physical wellbeing. But for the more serious, the track is used to warm up and prepare the body for more strenuous stuff, namely muscle building. 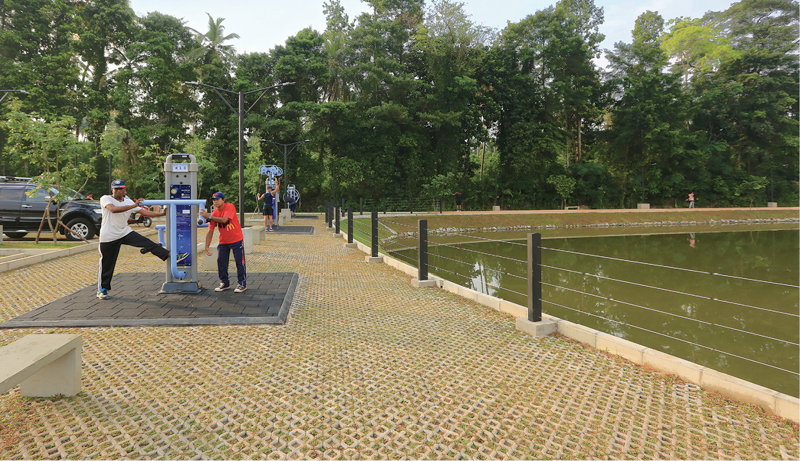 Between the paddy field and lake is a pathway which leads to the gym. It is housed in a smart, compact artistically designed building, which is equipped with dumb bells and chest and back strengthening exercising machines - in short all the equipment needed to build the body beautiful. The gym is open from 5.30 to 9 in the morning and opens again at 4.30 in the evening, closing only at 10 in the night. The Sri Lankan Army provides two instructors to train its users. Over 70 joggers are said to use the facility daily. The beauty of Aldeniya Suwatha Uyana is that all the components found there complement each other and blend in one singular theme of design to create a great atmosphere.A well laid straight track, which slightly winds towards the end, flanked by a children playground, a cooling tranquil lake, verdant vistas of lush green paddy fields and a well designed and fully equipped gym, make the Kadawatha's walkway a role model for future urban walkways to emulate. For more than 150 years the nation’s capital had only one walkway, the Galle Face promenade built next to the sea by the British Governor in 1859. Even after the grant of independence in 1948, this mile long walk on the beach front was the only walk where the Colombo genteel, clad in the fashion of the day, gathered, taking in the fresh air that gently blew from the Indian Ocean. 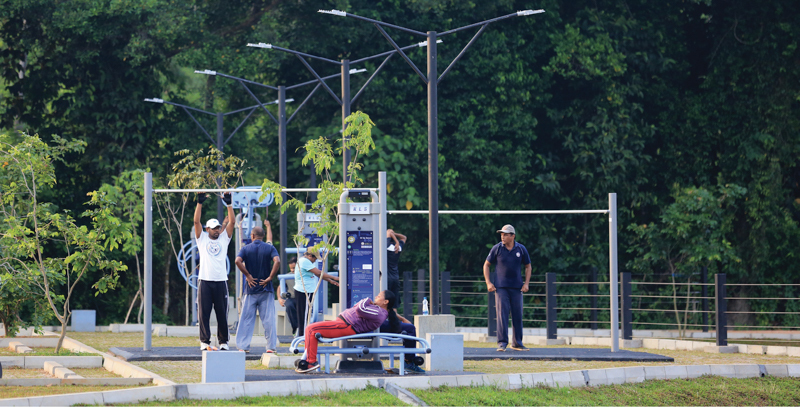 Taking a cue from a more health conscious world that promoted walking as an ideal form of exercise to keep mind and body in shape, a walkway was constructed at the nation’s Independence Square a few years ago. 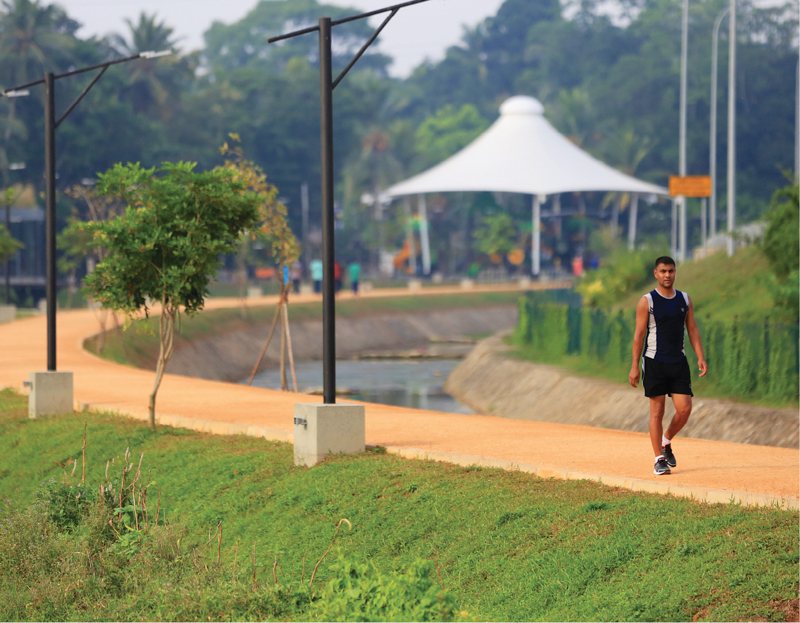 In the wake of its popularity, walkways began to mushroom in Colombo’s suburbs; and with the general urban populace discovering the joys of walking and the health benefits of exercise, soon a plethora of designer pathways sprouted in various areas in the suburbs. 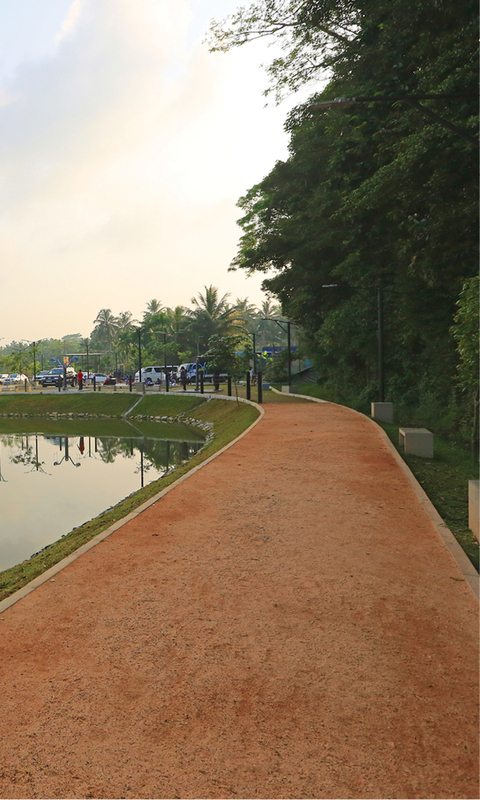 A walking track was built around Colombo’s main park, the Vihara Maha Devi Park. There are tracks in Nugegoda, Boralesgamuwa, Wattala, Diyatha Uyana in Battaramulla and even near the Parliament on the Japanese-Sri Lanka Friendship Road.